Nurses are vital to all that we do; they embody the spirit of humanity, service, expertise and innovation that defines Montefiore and its focus on superior patient outcomes. To patients and their families, Montefiore nurses provide steadfast comfort and guidance. 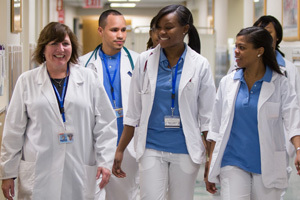 To the physician, Montefiore nurses are trusted colleagues who share a desire to meet the needs of our patients. A spirit of innovation and inquiry, empowerment, autonomy and accountability. Montefiore nurses are empowered to improve patient outcomes and deliver superlative patient care at every turn. We encourage responsibility, collegiality, pride in one’s work and willingness to look toward constructive collaboration in the workplace at every turn. Nurses who join Montefiore choose a career, not a job. Studies have shown that stable practice environments allow nurses to provide better, more consistent and inspired care. This is certainly the case at Montefiore: our remarkably low nursing turnover rate is one reason why nurses choose to work at Montefiore over a host of other alternatives in the New York metropolitan area.